The development of the Oklahoma River south of Bricktown in Oklahoma City has attracted national attention for events and recreational activities. Much of that is thanks to the Chesapeake Boathouse, a $3.5 million development funded by Chesapeake Energy Corporation. With stunning architecture designed by Rand Elliott, the boathouse is a premiere recreational destination in Oklahoma City, offering metro residents a number of fitness and recreational options. The Chesapeake Boathouse has advanced cardio and weight training equipment as well as yoga classes and bicycle rentals. But that's only the beginning. Get out onto the river with rowing, kayaking and dragon boating. The facility is also available for wedding receptions, corporate functions, field trips and more. 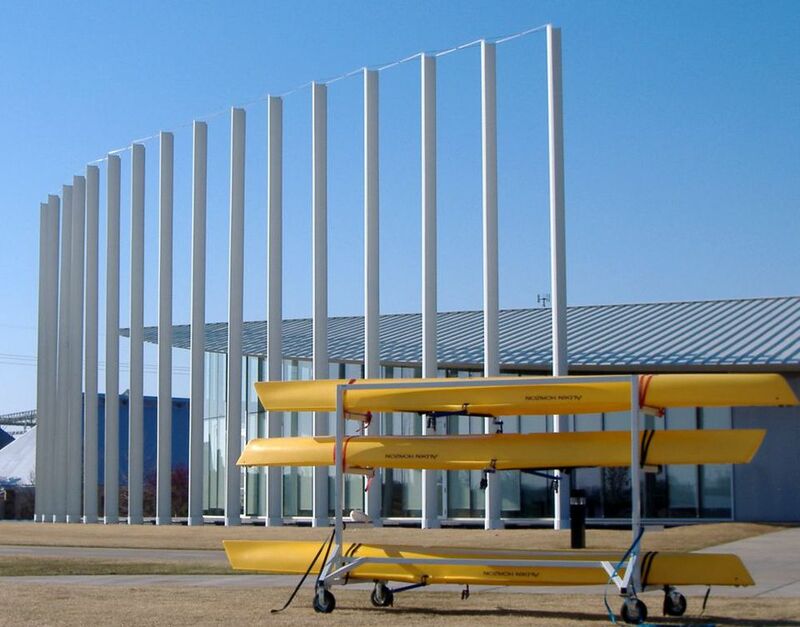 The Chesapeake Boathouse is located at Regatta Park on the north side of the Oklahoma River, just south of OKC's Bricktown on Lincoln Blvd. The boathouse and fitness center open at 6 a.m. during the week and close at 8 p.m. On Saturdays, they're open from 7 a.m.to 5 p.m., and Sunday hours are from 1 p.m. to 5 p.m.
Rowing - Whether it's for the athletically-demanding competition or just for fun, the Chesapeake Boathouse has it all for rowers. Kayaking - Rent a kayak for $19 an hour. Dragon Boating - The Asian tradition comes to the Oklahoma River. Be a part of competitive races or just have an outing with a group or organization. The Chesapeake Boathouse Fitness Center has state of the art cardiovascular and weight training equipment, showers and locker rooms. In addition, there are yoga classes, and you can rent a bicycle for use on the more than twelve miles of scenic trails around the Oklahoma River. RIVERSPORT school helps beginners learn to canoe and kayak. Also, there's a "Learn to Row" series for both juniors and adults.